Five years ago, in the aftermath of Superstorm Sandy, the potential of microgrids became abundantly clear when widespread disruption caused power outages across several US states. Against a backdrop of blackouts, buildings with their own microgrid systems stood out like beacons on the Manhattan skyline. Now, in the wake of Hurricanes Harvey and Irma, attention is again turning to microgrids and their ability to ‘island’ when the wider power grid goes down. Texas utilities reported that more than 300 000 customers were without power due to Hurricane Harvey. However, for many customers of Texas-based microgrid company Enchanted Rock, it was a different story as it had already installed microgrids on the sites of H-E-B grocery stores. As such, the stores could remain open despite black- outs on the wider electricity grid. Beyond North America, microgrids are electrifying remote villages in Kenya and providing a cost-effective alternative to upgrading transmission lines in Australia. They’re also offering ways of dealing with the rising levels of intermittent renewable generation in western Europe. As a result, microgrids are rising quickly up the energy industry’s collective agenda. 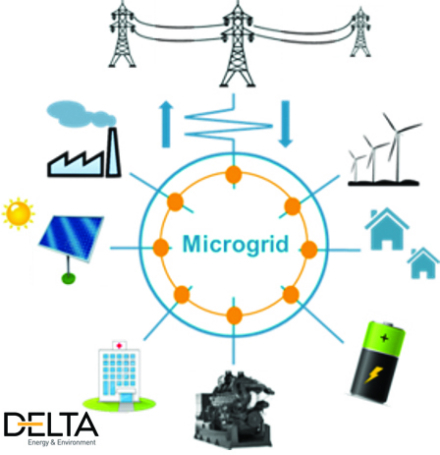 In a poll carried out by Delta-ee, only 13% of utilities, manufacturers and network operators claimed to be fully active in the microgrid sector. However, 28% were “actively engaged” and a further 39% were at “an early stage of exploring microgrids as an opportunity”. This surge in interest is down to several factors. Firstly, solar PV module costs have fallen by more than 75% in less than 10 years and now energy storage solutions are following a similar trajectory. Also, distributed energy resource (DER) deployment is growing exponentially. With an increasing number of DER assets deployed on the ground, it becomes a smaller ‘leap of faith’ to deploy a microgrid solution by using existing resources. Another factor is the greater demand for electric grid resiliency. In several global markets, there is growing need to provide grid support due to the closure of fossil- fuelled power plants, increasing rates of electrification, and rising deployment of intermittent renewables. Microgrids are well-placed to provide this support – often as a cost-effective alternative to upgrading electricity transmission lines. Despite the many opportunities, there remain some major challenges. The microgrid sector is – to a large extent – still at the ‘demonstration’ stage. Demo projects include Siemens’ microgrid implementation in Germany, which uses distributed, renewable energy assets such as solar PV and biogas plants. This highlighted the local low-voltage network’s ability to decouple from the wider power grid in the case of a fault, such as a black-out. It maintains the power supply to local residents and then re-connects to the wider grid once normal grid conditions return. It is a great illustration of the benefits, but this project remains a demonstration: a glimpse into the future rather than the announcement of a paradigm shift within the European power sector. Other examples include microgrids that are replacing diesel, often in remote regions or on islands. These microgrids can use solar PV as the primary source of electricity and just use diesel for back-up and peaking power. As a result, it is possible to offset diesel fuel consumption. With today’s solar PV prices, the diesel-replacement model is increasingly attractive. Australia is one of the most advanced countries when it comes to microgrids, outsideNorthAmerica.SouthernandWestern Australia have experienced fossil-fuel power plant closures and are seeing increasing volumes of intermittent renewable generation coming online. There are also many dispersed, remote communities with growing electricity demands. All of this has led to the emergence of microgrids as a cost-effective alternative to more conventional solutions. However, these drivers are fairly specific to Australia and don’t necessarily apply in other countries. In regions that rely on diesel for electricity generation, microgrids with solar PV are an effective way to make a good return-on-investment. But these cases are the exception rather than the rule. Where the electricity grid is largely stable, the economic proposition associated with microgrids tends to be more of a challenge. The UK, for example, has only a few microgrid developments, which are largely limited to the surrounding islands that have no access to the mainland grid. Declining costs will continue to be a major theme. Solar PV costs may not have much further to fall but there is plenty of scope to reduce costs associated with energy storage and microgrid design and control systems. There will also be new players entering the market as it becomes a more competitive space. End-users will have more choice, new business models will emerge and competition will reduce costs. The industry will also see regulatory frameworks catch-up, but slowly. Today, electricity grid regulations are among the biggest challenges facing the microgrid sector. Many existing regulations pre-date today’s advancements in decentralised power generation and they’re not designed tofacilitatemicrogrids.Inmanycasesthey can prevent microgrids being developed – even when they offer the most compelling solution. As the benefits of microgrids become better understood and more data emerges to demonstrate their value, electricity grid regulations will inevitably evolve but this could take years or even decades. To succeed in the microgrid sector, companies must target the right customer segments and markets and then develop business models that can derive the greatest value. While these are obvious tasks, the challenge comes in doing them well – especially across diverse and complex global markets. The key will be defining which countries to target, which customer segments hold the greatest potential and which innovations are in the pipeline. Companies that grasp the complexities of each will be in the best position to capitalise on future opportunities. As early adopters rollout out implementations and prove their success, they will pave the way for wider, mainstream deployments.